Mary's Thrifty Chic // Thrift Shop/Sew Easy! Meet what used to be an XXL polo. I purchased three unused (tags still attached) polo shirts from Goodwill at a price of $2.50 each. 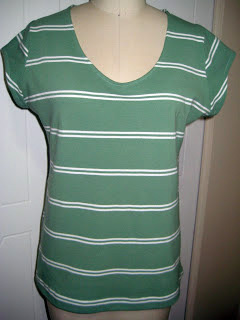 I made the pattern pieces from the purple one and created the basic green t-shirt you see here. 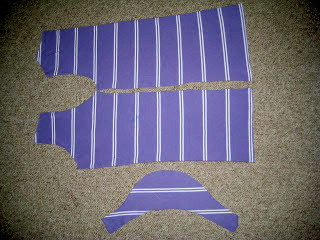 The pattern can be made with or without sleeves so I now have my own perfectly fitted custom made t-shirt pattern. They go together very quickly with my serger. The last shirt is solid yellow and I plan to make it sleeveless. I'll feature it when it is done.